Do you live in the Wolverhampton area ? This really can take away the pleasant look from your property and leave it looking unattractive, whilst also be damaging the tiles, blocking your gutters and creating other maintenance issues that can turn out to be very costly. This is the most delicate approach to roof cleaning available. The way soft washing a roof works is to remove the bulk of moss of the roof tiles. This can be done either using telescopic tools from our portable scaffold tower meaning we are ale to remove the debris without stepping a foot on the roof or if the access doesn't allow us to do this then we would scrape the roof using both roofing ladders and fall arrest equipment ensuring health and safety is met at all times. Once the moss has been removed from the roof it is then time to apply our specialist roofing treatment to kill all biofilm present and prolong any regrowth, once the treatment has killed all the biofilm on your roofs tiles the tiles over a period of time you then start to notice the tiles self cleansing. Pressure washing roofs seems to have a lot of bad press with a lot of people very wary of having there roof tiles pressure cleaned. Done correctly pressure washing your roof tiles is 100% safe for your homes roof and can really give phenomenal results and instantly transform the look of your home. Using the correct pressure, nozzles and safety equipment is paramount when cleaning a roof via pressure washing so its defiantly worth using a professional exterior cleaning company with many years experience in the roof cleaning sector. 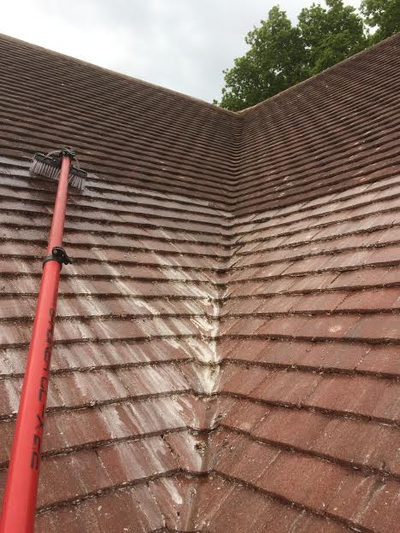 On every site visit we will discuss all options available and talk you through each process, explaining the difference between soft washing, pressure washing and manual moss removal options to clean you roof. Health and Safety is more important than ever when working on roofs, so Full Fall Arrest Equipment, Harnesses and portable scaffold towers are used making our roof work as safe as possible. 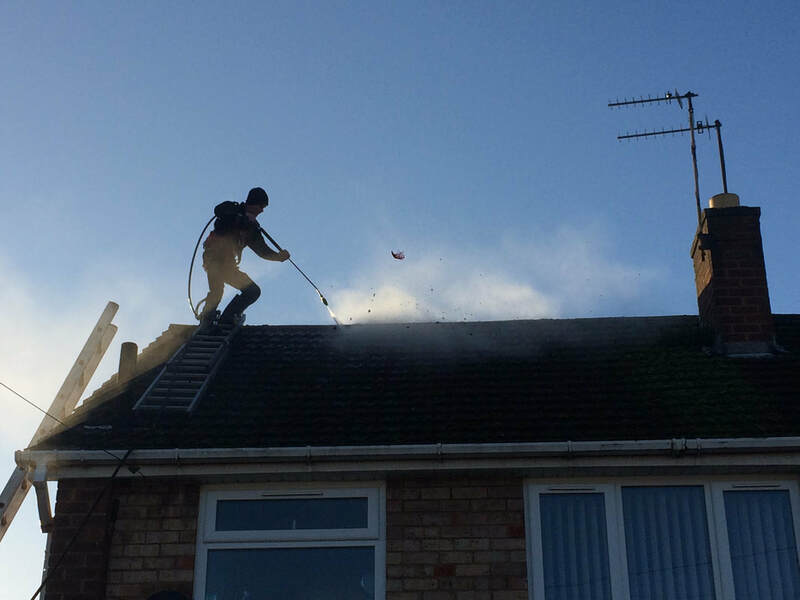 Our roof cleaning operatives have many years experience cleaning roofs and are fully training at working at height and roof top safety. After every clean an anti-fungicidal treatment is applied to kill any remaining spores and to help prevent / minimize any regrowth. 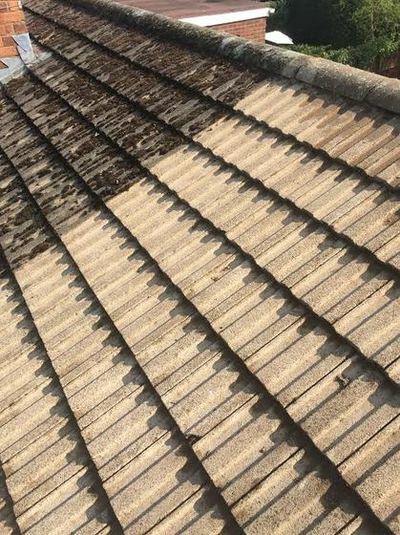 Not only do we clean your roof, also while we are up there we are able to replace broken tiles and re-point any ridges, hips, valleys and eaves that may need attention. We understand that for a customer to see the condition of the roof its hard from the ground so photos are taken prior to any work been undertaken to show our customers the condition of the roof.